Today I am on my way to the Novelists, Inc. conference at St. Pete Beach. As I am contemplating what to say here, I’m thinking about the benefits of spending a wad of money to attend a writers conference. Ninc focuses solely on the business of writing for career professionals. You must have two published novels to join, so the membership consists of multi-published authors. This makes it different from any other conference, which may be aimed toward fans or writers at all levels. Ninc doesn’t aim to teach you to write. It aims to get you up to date on industry news and trends in publishing; the how-to’s regarding promotion & marketing, indie publishing; legal aspects like literary estate planning and forming a collaborative group to produce a book box package; how to use Amazon or Book Bub or Goodreads effectively. Reps from Kobo, Amazon, iBooks and more will be present. I can’t wait to attend. I can pick anyone’s brain there for any career questions I might have, and I have plenty. Ninc is a goldmine of seasoned, professional authors. · Attracting new readers, as authors are readers, too. 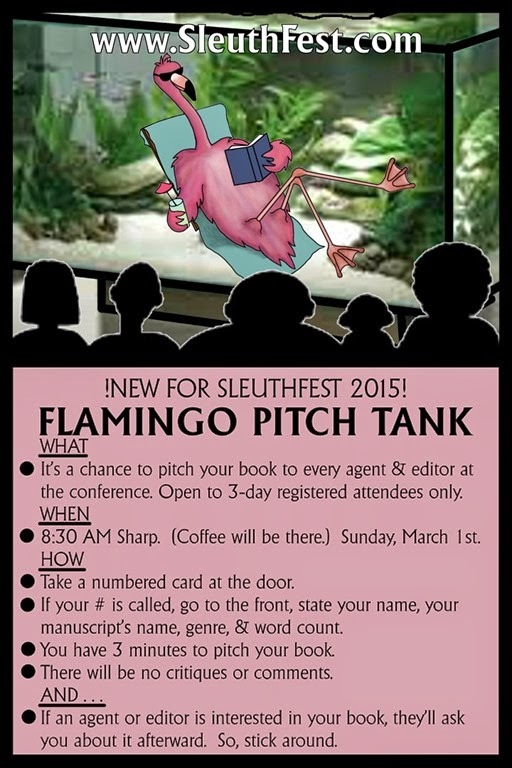 I have been attending SleuthFest for years. This premier mystery writers conference will take place Feb. 26 at Deerfield Beach, FL. 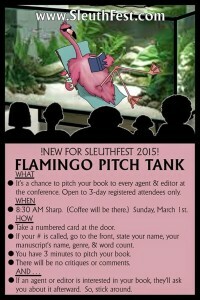 And new this year is the Flamingo Pitch Tank, where you get the chance to pitch your novel to every attending editor and agent at once. This is in addition to one-on-one appointments. You’ll learn about marketing and brush up on your other writing skills. Last year I attended workshops on Kobo and ACX. So check out this event before it sells out. James Patterson and Dave Barry are guest speakers. What other reasons can you offer for attending a writers conference? As I will be unable to respond, please talk amongst yourselves. I’ll respond next week when I am back home.